A series of inspirations to accompany you through the news and the main updates of the Segis collection. 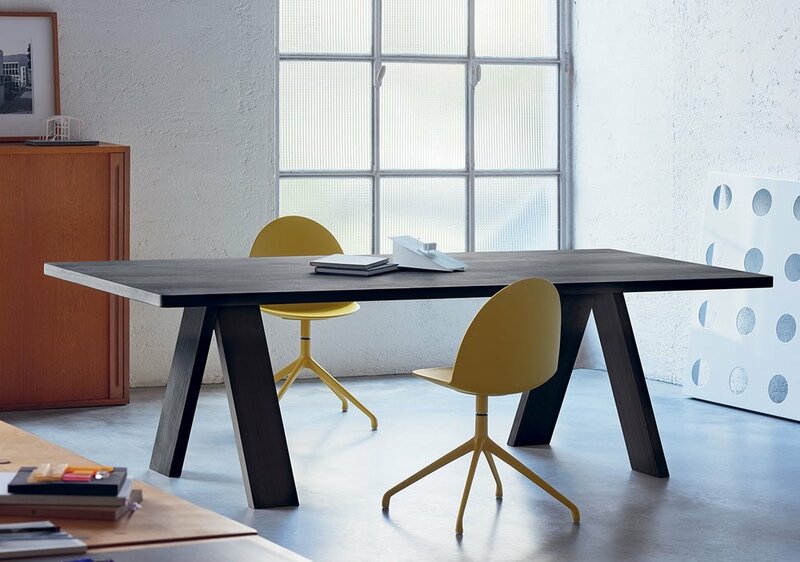 Table with essential and rigorous lines stands out for its original legs composition. These are arranged perpendicularly as well as at an angle, suggesting a circularity that amplifies the overall lightness of the piece. Solid oak available in natural or black aniline stain, Artful is perfect for both corporate meeting spaces and residential living areas. A modular seating system characterised by a strong expressive versatility conceived for fluid, linear and angular combinations. Comfortable pieces designed for enjoyable relaxation and conviviality. The collection includes two and three seater sofas plus an armchair; armrest options include an upholstered armrest in two sizes (7 and 14 cm) and a tablet arm for computer or other support. Joining tables between the seats or multifunctional tables complete the collection. The feeling of comfort that the Billa armchair inspires is immediate. Characterised by its curved beech plywood backrest, Billa wraps you in a feeling of calm warmth guaranteed thanks to the padded panels upholstered in fabric or leather. is an armchair and a lounge armchair, available with a low or high back, thus fulfilling synergistic needs. Its variety makes it perfect for any environment, from contract to home, from hotel room to meeting room... elegant in every situation.